Elizabeth McGovern (Downton Abbey) and Madeleine Peyroux. Northport N.Y.- “Duke Robillard & His Dames of Rhythm,” is an eclectic collection of Jazz/Swing tunes from the 1920’s & 30’s. 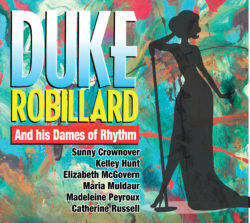 Duke invited some swinging and sultry ladies to the party, Maria Muldaur, Catherine Russell, Kelley Hunt, Sunny Crownover, Elizabeth McGovern (Downton Abbey) and Madeleine Peyroux. The record features a generous 15 tracks with liner notes from acclaimed producer and D.J. Bob Porter. The record is eligible to be voted on in the 1st round of the 2019 Grammy Awards. Duke, a founding member of the acclaimed swing band Roomful of Blues has recorded and toured with a who’s who of roots music including Bob Dylan, Herb Ellis, Big Joe Turner, Ruth Brown and John Hammond to name several.